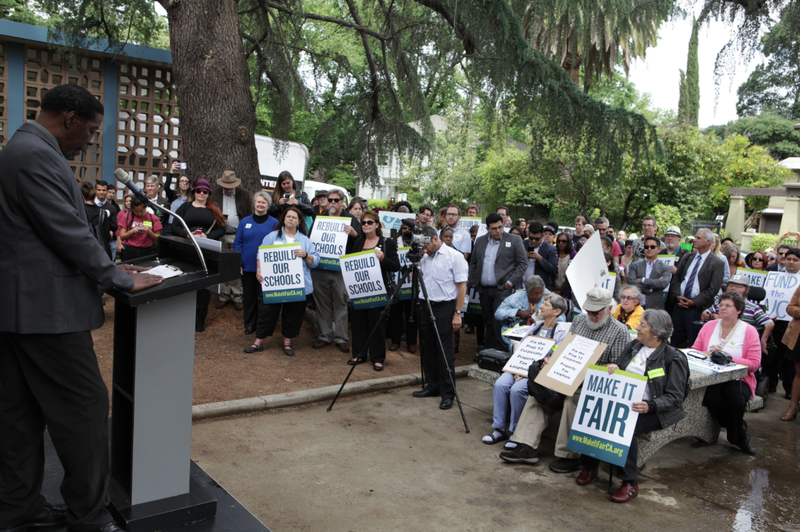 On a chilly May 7th morning, more than 200 members of California’s civil rights, religious, education and labor communities traveled from across the state, along with members of the press, to Sacramento’s Sutter Middle School to declare that we need to Make It Fair for California’s families and communities. Our coalition, made up of over 30 member organizations, is dedicated to changing California’s tax code, making it fair to all by phasing out loopholes in Prop. 13 that have allowed a handful of giant corporations and America’s wealthiest commercial property owners to dramatically lower their obligations to California families. By making California’s tax code fair, the state could see as much as $9 billion in additional revenue for schools and other community services. While our coalition is working to revise California’s tax code, the legislation will protect homeowners, renters and agricultural land, provide tax relief for most small businesses and include tough transparency and accountability measures so that everyone can see how any additional funds are spent. The speakers and the hundreds of attendees stood in front of the middle school while students went about their busy day inside. Sutter Middle School is the exact sort of service that would receive additional funds when the commercial property tax loopholes are revised. We have a long road ahead of us—and we’re just getting started—but we are working to Make It Fair to ensure that our schools, public safety services, roads, libraries and other vital, local services are all fully funded for California’s families and communities.